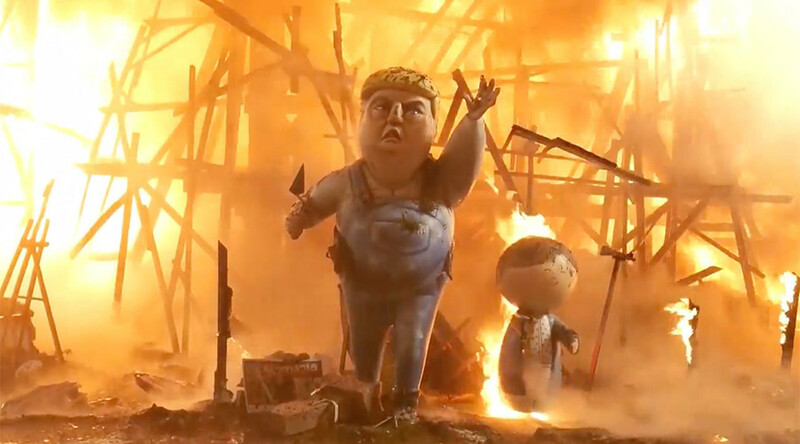 Valencia’s annual fire festival went out with a bang on Sunday, with the Spanish event hosting a blazing pyrotechnics display and the burning of an effigy of US President Donald Trump. Las Fallas, traditionally a celebration of St Joseph, involves the building of satirical Ninot figurines of well-known characters, which are then set ablaze. This year saw Trump’s likeness paraded in front of mass crowds before it was sent up in smoke. Earlier, a number of children’s sculptures were set alight, while the fiery festival wrapped up with a spectacular fireworks display in Valencia’s Plaza del Ayuntamiento. Y así damos la bienvenida a la primavera los valencianos. Foto de Ángel Tejo. Images of Trump’s effigy show the Republican sporting a pair of denim overalls and building a concrete wall, playing on the president’s desire to erect a border wall between the US and Mexico. The latter’s tricolor also featured in the festival mock-up. The Trump figure was burned alongside a giant dragon and was one of the last pieces to collapse from the heat of the flames. Paco Romero, one of the festival’s organizers, explained how the destruction of Trump’s effigy was in keeping with the tradition of satirizing powerful characters. Last year, a puppet version of German Chancellor Angela Merkel was set on fire at the event. “The Falla [Spanish for ‘fault’] goes with a slogan that is ‘Ti en ci’ which means the Son of Heaven,” he said. “In a way, the kings of the world are being represented and Trump represents one of the kings of the world right now.